There is a famous saying that goes like this ... "may you live in interesting times." While every generation has felt that saying applied to them, there can be no doubt that we, too, are living in very interesting times during the 21st century. But is "interesting" always good? In the last week I have ready stories about Elon Musk wanting to merge artificial intelligence with human intelligence. The goal, so he says, is to "connect your brain to the digital version of yourself." Interesting. And I didn't even know there WAS a digital "version" of myself. Must be getting old. And then there is this - Facebook insiders are beginning to regret their decisions about how the service runs. Sean Parker and Chamath Palihapitiya, both Facebook insiders, have recently come out publicly against what they helped create at Facebook. And lastly, Kim Komando, host of a huge weekend radio show - 6 million weekly listeners - about technology (and not a Facebook insider at all) went on a rant last weekend encouraging all her listeners to delete their Facebook accounts. Her complaint, in part, is Facebook charging ever more for promoting posts and running ads on their platform. She also mentioned how time-consuming Facebook is and lamented how Facebook works hard to keep us "hooked" on their system. On the business front, two major online marketers are now warning that Facebook is in the process of changing the rules regarding advertising on Facebook ... again. This change is being compared to the Google slaps of the past. A major blow to advertisers. How do you feel about Facebook as a platform for personal use? If you use Facebook, how much time a day do you spend there? 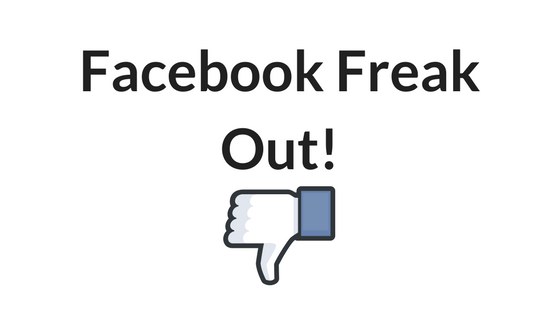 How do you feel about Facebook at a business tool? Do you use "promoted posts" and do they work for you? Have you made sales or grown your list using Facebook? Leave a comment below. I'd love to know what you think. Hi Charlie, I use Face Book to connect with friends & relatives. I’ve tried to used it for ads but it will not work, no list, no clicks no anything, just money down the drain. It’s a harder needle to thread than it used to be. No doubts there. A marvelous post, Charlie, with great current information and provided in a great article demonstrating curated material at its best. I think that just like any internet tool Facebook has its place but that we should take care with its use. Overdependency is to be avoided and we need to be sure we get value for the time we invest in this medium. Common sense and wise thinking as usual! Thanks, Gerry. CHARLIE, HERE’S AN ILLUSTRATIVE CASE. Just did my first ad ($20 ) to promote a free lead gen ( paranormal short story) for my new fiction site. No action yet in 2 days. I agree with many comments so far re the complexity, the time, the constant learning curve to match FBks changing rules.Just saw a group that will handle all ads, testing etc for a monthly fee of $ 50.They rec’d $10./day spend. I’m Canadian so that means 35% MORE (or, say $14/day) and THAT that means $65 plus about $420 in spend for a total of approx $485 /month. To promote a freebie! Of course, it’s different if you are SELLING a $3 book but…! I hear you! I do find the process of boosting posts to be much more straightforward. There are SO many individuals and companies who will “manage” your Facebook ads that making the choice is quite a challenge. Especially if your budget is what they consider “small” (read, under $5000 per month). There is a solution and I’m determined to find it and share it with my readers. I was quite happily advertising on Facebook until suddenly my ads were “disabled” I begged and pleaded to know what I did wrong so that I could right it but was just shunted from “Billy to Jack” until I decided, enough is enough…needless to say, Facebook no longer interests me. Sadly, this is a story one hears over and over again. I’m sorry that happened to you. the customer is always right unless you are as big as us. Pity they can`t be given a sharp slap themselves, by an enlightened rival perhaps. Many people feel resentment toward the big tech companies. Apple hurt itself recently with the battery issue. Google, YouTube, Facebook, and Twitter have all been in the news lately for questionable policies. I think the free market will correct many of these problems in time. Hope so at least. At the present time, I only use Facebook for maybe 15 to 30 minutes when I think about it. I was planning to begin using it for marketing purposes but haven’t got there as yet. I don’t hate Facebook mainly because I don’t really use it that much but suppose that in time I will find out whether it’s good or bad. I would certainly never advocate for any sort of hate. So I’m glad you don’t hate them. I do believe that they can be useful for individuals wanting to sell things online although keeping up with the changes can be a challenge. Hi Charlie — I have never used Facebook for business – I spend maybe an hour a week on it. Keep up with friends and associates mainly. I have always seen and heard that advertising on Facebook was complex, expensive and with mixed results. Thanks for the heads-up – will probably never use Facebook for business. It doesn’t really fit my market anyway. Facebook ads are a mixed bag. When they work oh man do they work. But one must keep up with it. Much less “set it and forget it” than one would hope for. I do think your market is on Facebook (to some extent) and would recommend installing the pixel on your site so you can create a custom audience at some point. The good thing about putting the pixel on your site now (at least, this is how it works today) is that you can go to Facebook later and create an audience from the people who visited since you installed the pixel. Facebook is definitely a black hole, but I limit my time there. I have found it useful to connect with long lost friends, and that is the main reason I stay there, at this point. I originally joined for marketing purposes. I am now discouraged by the changes being made, and it no longer being a marketer-friendly place. I’m tired of all the ads, and ads in videos, now too! I do own some shares of FB, though, and those are doing well for me. The time drain is a constant complaint from Facebook users. They have designed their system so that’s it is full of shiny objects, all designed to keep you using Facebook longer and longer. Connecting with friends is a beautiful thing and that is what Facebook excels at doing. While I do wish some of their business practices were different, I would not rule them out as an advertising option completely. When done right, Facebook targeting is second to none.